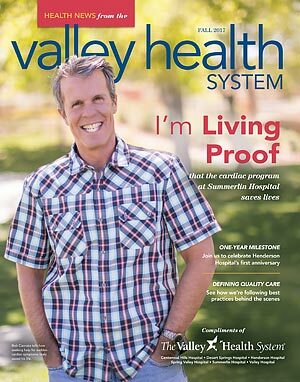 Health News from the Valley Health System is a publication designed to bring you the latest news as well as health and wellness information you can use throughout the year. You can read the latest issue here, or sign up to have Health News mailed directly to your home. Since affiliating with The Valley Health System in August 2016, Desert View Hospital has continued to care for patients who need emergency services and more. Bob Cannata keeps himself in good physical shape and never thought he would have a heart problem. At age 54, however, he noticed something might be wrong. Rachel Moenoa, 33, had her first heart valve replacement when she was just 9 years old. She had a second surgery in her teens and went on to live an active life until last year, when she began to experience shortness of breath. How do you define quality healthcare? For a patient undergoing a hip replacement, it may mean a successful surgery, assistance with pain medication and personal needs, and time spent with a physical therapist to begin walking and learning useful tips for getting out of bed or using the bathroom. The autumn season can be a great time to regroup and refocus on your health and wellness goals. If you’re among the many people managing a diabetes or pre-diabetes diagnosis, there’s lots of support available to help keep you feeling your best! If you believe you or someone else may be having a possible stroke, don’t wait. Dial 9-1-1 immediately. Chronic wounds can have a big impact on people’s health and quality of life. “Over 5 million people are affected, and out of those patients, people over 65 account for 85 percent of the cases,” says Lubna Javed, MD, Medical Director of the Advanced Wound Care and Hyperbaric Center at Spring Valley Hospital.